Spring 2019 Sale: 20% off with code TPC20 at checkout. Ends May, 1 2019! Watch video to see how easy it is to save money on your Tennessee Marriage License by quickly receiving our notarized certificate of completion!!! Welcome to the Official $30.00 Tennessee Premarital Preparation Online Course, where Tennessee comes for online premarital preparation counseling to prepare for their marriages and to save money. Did you know in the state of Tennessee, its citizens can participate in a four hour premarital preparation course provided by a Tennessee licensed mental health provider or an active member of the clergy. I am licensed clinical psychologist in Florida, but not in Tennessee yet; however, I am an ordained minister recognized in the state of Tennessee to administer a premarital course which qualifies me to provide you with our Tennessee Premarital Preparation Program and an official notarized certificate that will save you money on your Tennessee marriage license. A marriage license in Tennessee costs $99.50. By taking our premarital course, you will save $60 off your marriage license. With our certificate in hand, your marriage license fee at the court house is just $39.50. Just bring our certificate to the court house and enjoy the savings and learn a lot about yourselves and each other. 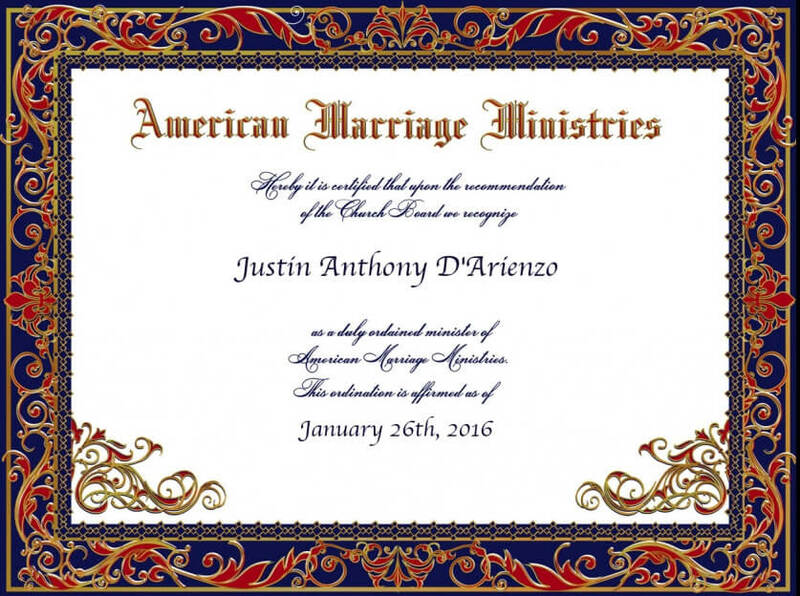 Again, by taking our course, you will save $30 dollars off your marriage license. Click on the Click Here to Purchase button above and below to make your secure payment (Paypal or credit card). You do not need a Paypal account to pay and can chose the credit card option rather than Paypal. We use an e-commerce site called Cart66 that processes payment in both fashions. If you do not want to pay online, you may also contact our office directly at (904) 474-3854 to make a payment during regular business hours (9-5) Monday through Friday. Both options are secure and quick methods to get started. Please note that payment for any of our online courses are non-refundable unless you accidentally purchase more than one. Once payment has been received for the course, you will receive an automatic email with the password and the login page, or you can use the password sent to you and click here: Login to the Tennessee Premarital Preparation Course Login Page or at https://www.drdarienzo.com under the courses tab. If you are having trouble finding your password or accessing the course, please contact our office during our normal business hours of Monday through Friday from 9:00 a.m. to 5:00 p.m. EST (904-474-3854). After logging in with the password, you will have 30 days to complete the course. Tennessee law requires that you spend at least 4 hours on the premarital course. Our Online Tennessee premarital course is structured to be completed with exercises and takes at least 4 hours if completed as instructed. Please follow the Tennessee statute by spending at least 4 hours on the course. Once you have finished reading through the material and completing the exercises, you will need to take the quiz. Please take your time and fill out the information accurately. After the quiz has been submitted, we will be notified, and we will mail you your Official Notarized Tennessee Premarital Preparation Course Certificate Form the next business day. It can take up to one (1) week to receive your certificate in the mail so please plan ahead. In the event you need your notarized certificate, earlier, we can overnight it but there will be an additional charge. Call us about any questions you may have. Planning a Summer Wedding in Tennessee? Summer is a wonderful time to get married in Tennessee. Let us help you save money on your marriage license and improve your relationship before you get married. Why not start the summer off right and take our course designed just for you before you marry this summer. Please call us at 904-379-8094 or email us at [email protected] if you have any questions. We will complete this form and notarize it for you once you complete the course. We will then send it to you by mail because you need the original certificate.